Kovalam is one of the most beautiful and popular beaches in Kerala. 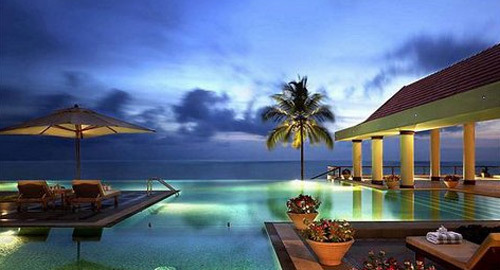 Plan your Honeymoon in Kovalam to see the real natural beauty at its best. Kovalam stands true to its name, which means 'Groves of Coconut'. The sandy beaches of Kovalam are lined with swaying coconut palms under which you can relax and chat with each other, sunbath to get a ravishing suntan or watch the people around you in varied activities on Honeymoon in Kovalam. So Kovalam is right Honeymoon Place in India. Kovalam is not just one single beach but cluster of three beaches lined one after another. Visit the Lighthouse Beach, Hawah Beach and Samudra Beach on Honeymoon in Kovalam. Vizhinzam Mosque is worth watching on the Lighthouse Beach. The nearby tourist sights to discover on Honeymoon in Kovalam are Palaruvi Waterfall, Trivandrum, Kollam, Varkala and Thekkady. Honeymoon in KovalamHoneymoon in Kovalam comprises of usual beach activities such as strolling on the beaches, relaxing under the coconut palms, sunbathing and trying out tempting seafood delicacies. The adventure in the Honeymoon in Kovalam comes from series of water sports such as swimming, water skiing, kayaking and surfing. Kovalam is also a famous Ayurvedic health center. So pamper your body with the soothing and relaxing Ayurvedic massages. Shopping items at Kovalam include ethnic handicraft, carpets of Kashmir, Rajasthan and Tibet, batik prints, beach mats and leaf paintings that make from interesting souvenirs to take back home after the Honeymoon in Kovalam.